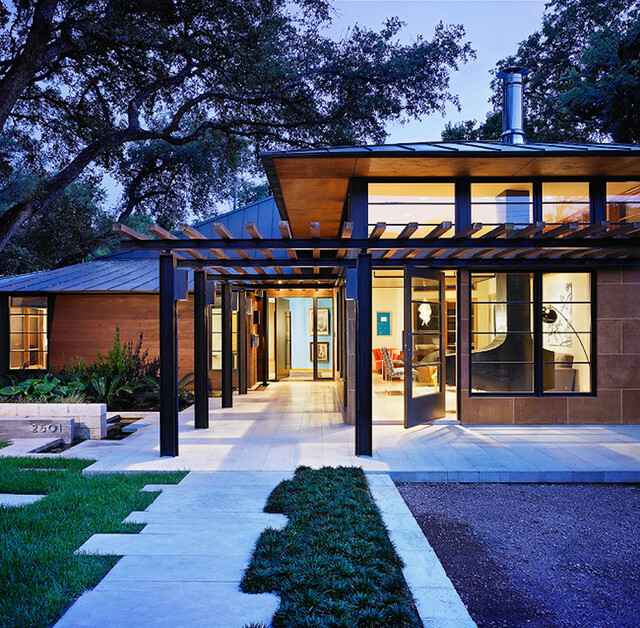 Outdoor living is constantly evolving. As more homeowners realise the value of merging indoor entertaining with smart exterior design, it’s become necessary to cater for best of both worlds and stay up to date with the latest trends. Elevating your outdoor living experience means getting the right set up for your needs and a pergola is one of the best ways to create additional outdoor entertaining space. For a backyard space to truly ‘pop’ you need to create visual interest through layers. Pergola designs that flaunt arches and curves offer an artistic appeal to a dull looking outdoor area, whilst offering a comfortable space in the shade on hot summers’ days. Pay attention to any architectural features your home already showcases and tap into these details when considering the design of your pergola. This will help to introduce similar complexity to the outdoor structure and create artistic curves that reflect the best of your home. Arched rooflines and shallow curves can make for an impressive focal point in the space, especially if you don’t have the time or budget to tackle the landscaping yet. You can opt for a dome pergola design that’s either attached or detached to your property, or get creative with custom-made curves. There’s something very inviting about that cabin feeling in the woods. Relaxing in the heart of nature surrounded by lush landscapes and rustic appeal, the lodge style setting has taken over many man caves and pergola designs over the years. Designed to evoke the stunning rustic lodges renowned to national parks and holiday spots, lodge style pergola designs look beautiful paired with an outdoor kitchen and fireplace. 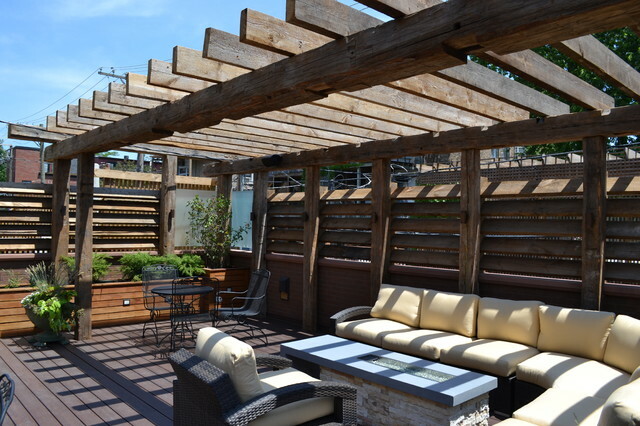 Keep the style consistent by blending other natural materials into the design, like a wood deck and stone patio garden. This will help your space to blend with the landscape and create a natural extension. Rustic lodge pergola designs can also be enhanced with the use of ivy or other climbing plants to really create that holiday cabin feeling. 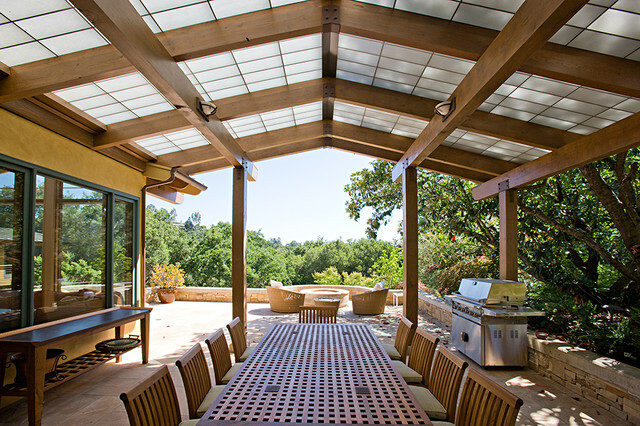 The initial boom of pergolas were to enjoy summer outdoor entertaining. Especially in Australia, outdoor living has always been popular and crafting a space that can cater to the needs of homeowners, whilst keeping out of the harsh summer sun is priority. 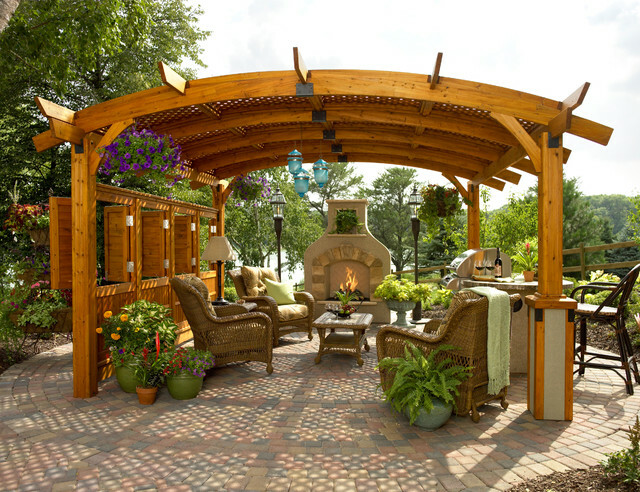 Turn your pergola space into a winter-friendly solution by creating adequate shelter. 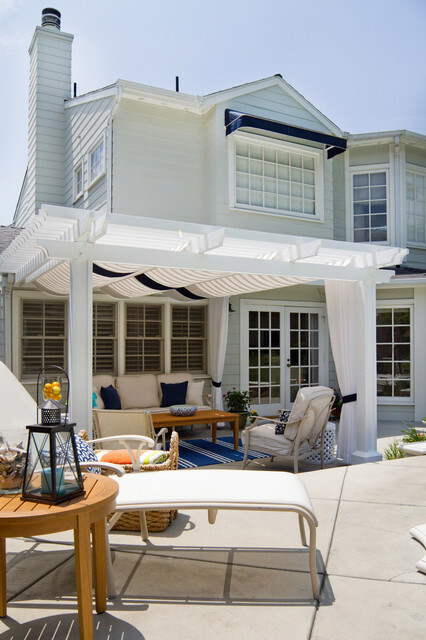 Opt for a pergola design with a retractable roof so you can enjoy the best of both worlds throughout the year and make use of outdoor louvres or blinds to shield the pergola’s sides during those rainy and windy days. Deck the pergola with cosy outdoor furniture and heating features like fireplaces. The timber appeal is by no means a new thing. From pool decking to interior flooring and pergola projects, its natural warmth is impressive. But 2016 sees these wooden pergola designs boom through the roof with a modern charm. You don’t need to go too over the top with timber pergolas. Instead, opt for a design that’s clean, simple and classic. Contemporary timber pergola designs are perfect for creating that alluring backyard oasis many homeowners and investors are attracted too. Choose a wood that can be stained or painted to add your own personal touch to the space or leave it to weather naturally to showcase its wooden texture. If you really want to create that ‘wow’ factor in your backyard space, look for pergolas that scream uniqueness. 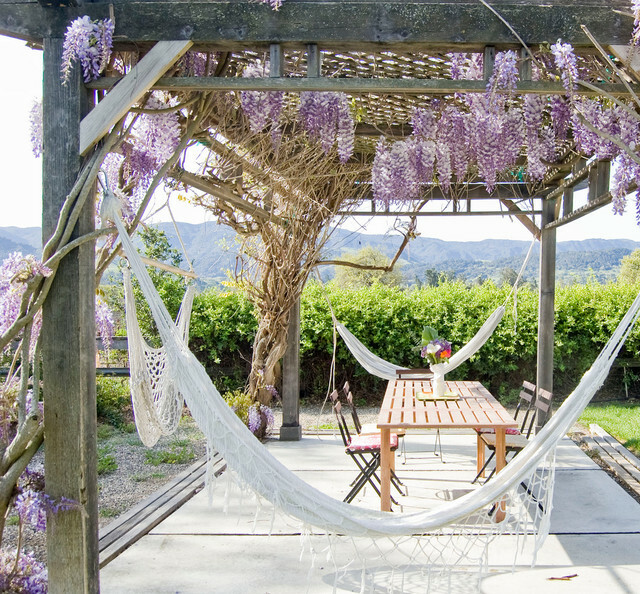 The right pergola design can transform the look and feel of the outdoors, but to take that sanctuary feeling to the next level, bold ideas will certainly boom. 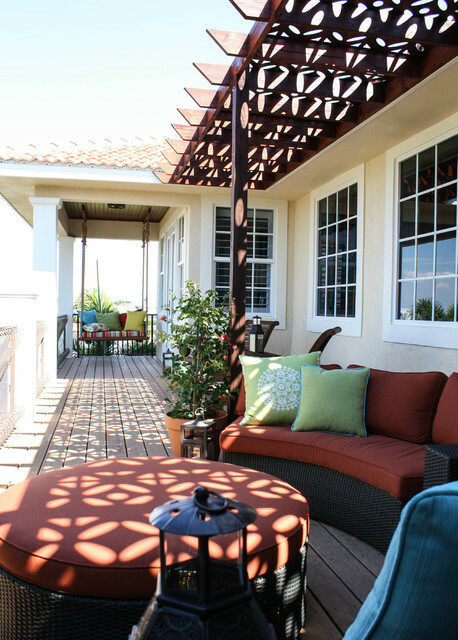 Integrate the pergola design with a tropical deck area and key accessories to make the space stand out. Bright colours on a splashback of contemporary, natural materials will elevate the design whilst paying attention to architectural details and features will spark visual interest. This article is written by Jayde Ferguson, who writes for Great Aussie Patios – Perth’s leading pergola and patio builders with a unique design solution for any outdoor space. You can catch her on Google+.